The credit rating agency says that it is cutting the country's top AAA rating by one notch to AA-plus. The credit agency said late Friday that it is making the move because the deficit reduction plan passed by Congress on Tuesday did not go far enough to stabilize the country's debt situation and that the policymaking is not stable or effective as needed to address the current economic challenge. 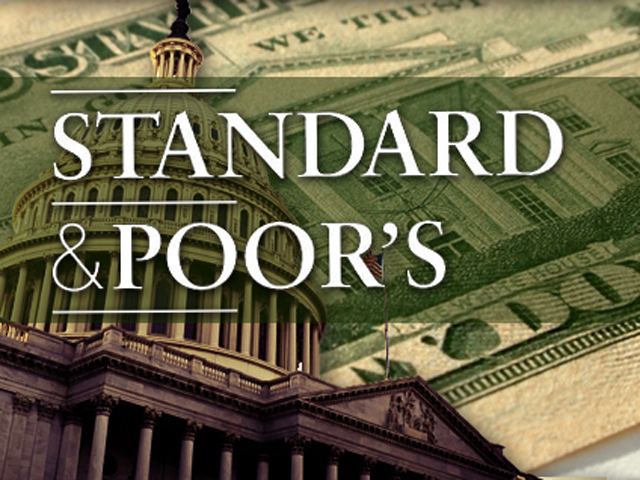 S&P said in a statement that "the downgrade reflects our view that the effectiveness, stability, and predictability of American policymaking and political institutions have weakened at a time of ongoing fiscal and economic challenges to a degree more than we envisioned when we assigned a negative outlook to the rating on April 18, 2011." It added: "The outlook on the long-term rating is negative. We could lower the long-term rating to 'AA' within the next two years if we see that less reduction in spending than agreed to, higher interest rates, or new fiscal pressures during the period result in a higher general government debt trajectory than we currently assume in our base case." A Treasury Department spokesperson said in reaction to the news of the downgrade: "A judgment flawed by a $2 trillion error speaks for itself." On Friday afternoon, Treasury officials discovered what they said was a $2 trillion error in S&P's math. S&P did not address the alleged flaw in its statements. S&P first put the government on notice in April that a downgrade was possible unless Congress and the administration came up with a credible long-term deficit reduction plan and avoided a default on the country's debt. After months of wrangling and negotiations with the administration, Congress passed this week a debt reduction package that averted a possible default. In its statement, S&P said that it had changed its view "of the difficulties of bridging the gulf between the political parties" over a credible deficit reduction plan. S&P said it was now "pessimistic about the capacity of Congress and the administration to be able to leverage their agreement this week into a broader fiscal consolidation plan that stabilizes the government's debt dynamics anytime soon." A source familiar with the discussions said that the Obama administration believes S&P's analysis contained "deep and fundamental flaws." One of the biggest questions after the downgrade was what impact it would have on already nervous investors. While the downgrade was not a surprise, some selling is expected when stock trading resumes Monday morning. The Dow Jones industrial average fell 699 points this week, the biggest weekly point drop since October 2008. "I think we will have a knee-jerk reaction on Monday," said Jack Ablin, chief investment officer at Harris Private Bank. But any losses might be short-lived. The threat of a downgrade is likely already reflected in the plunge in stocks this week, said Harvey Neiman, a portfolio manager of the Neiman Large Cap Value Fund. "The market's already been shaken out," Neiman said. "It knew it was coming." One fear in the market has been that a downgrade would scare buyers away from U.S. debt. If that were to happen, the interest rate paid on U.S. bonds, notes and bills would have to rise to attract buyers. And that could lead to higher borrowing rates for consumers, since the rates on mortgages and other loans are pegged to the yield on Treasury securities. However, even without an AAA rating from S&P, U.S. debt is seen as one of the safest investments in the world. And investors clearly weren't scared away this week. While stocks were plunging, investors were buying Treasurys and driving up their prices. The yield on the 10-year Treasury note, which falls when the price rises, fell to a low of 2.39 percent on Thursday from 2.75 percent Monday. The government fought the downgrade. Administration sources familiar with the discussions said the S&P analysis was fundamentally flawed. They spoke on condition of anonymity because they weren't authorized to discuss the matter publicly. S&P had sent the administration a draft document in the early afternoon Friday and the administration, after examining the numbers, challenged the analysis. The Federal Reserve and other U.S. regulators said in a joint statement that S&P's action should not have any impact on how banks and other financial institutions assess the riskiness of Treasurys or other securities guaranteed by the U.S. government. The statement was issued to make sure banks did not feel that the downgrade would affect the amount of capital that regulators require the banks to hold against possible losses. The downgrade is likely to have little to no impact on how the United States finances its borrowing, through the sale of Treasury bonds, bills and notes. This week's buying proves that. "Investors have voted and are saying the U.S. is going to pay them," said Mark Zandi, chief economist of Moody's Analytics. "U.S. Treasurys are still the gold standard." He noted that neither his parent organization, Moody's, nor Fitch, the other of the three major rating agencies, have downgraded U.S. debt. Japan had its ratings cut a decade ago to AA, and it didn't have much lasting impact. The credit ratings of both Canada and Australia have also been downgraded over time, without much lasting damage. "I don't think it's going to amount to a lot," said Peter Morici, a University of Maryland business economist. Still, he said, "The United States deserves to have this happen," because of its clumsy handling of fiscal policy. Ratings agencies Moody's and Fitch both maintained the U.S.'s AAA credit rating following the debt deal. Moody's, Fitch and S&P are the three main ratings agencies that rate debt that is issued by governments and corporations. The triple-A rating is the highest available and signifies an extremely low likelihood of default. All three agencies had issued warnings in recent weeks that the U.S. credit rating was in danger of a downgrade. Critics say the agencies have an outsized impact on U.S. economic policy and point to the firms' failure to correctly assess risk before and during the 2008 financial crisis. Prior to leaving for Camp David for the weekend on Friday, President Obama met with Treasury Secretary Geithner in the Oval Office. On Tuesday, Fitch Ratings said that the action by Congress to boost the debt ceiling and make spending cuts was an important first step but "not the end of the process." Moody's in its announcement noted that the legislation signed by Obama called for $917 billion in specific spending cuts over the next decade and established a special congressional committee charged with making recommendations to achieve an additional $1.5 trillion in deficit reduction over the next 10 years. "While the combination of the congressional committee process and automatic triggers provides a mechanism to induce fiscal discipline, this framework is untested," Moody's said in its statement. "Should the new mechanism put in place by the Budget Control Act prove ineffective, this could affect the rating negatively." A credit-rating downgrade typically leads to higher interest rates, and would have a huge impact on the economy by making it more expensive for the government, companies and consumers to borrow money. Moody's has never given the U.S. government anything lower than its top rating since it began evaluating the country's debt in 1917.